Seidner’s Collision Centers director of development and training Gene Lopez told the California Bureau of Automotive Repair this month that OEM repair procedures and position statements should be followed — except in the case of certain recycled and aftermarket parts. “I have to be a little bit careful, because we’re asking for the cake and wanting to eat it too,” Lopez acknowledged during his presentation at the agency advisory group’s July 12 quarterly meeting. This regulation should be reworded to emphasize following OEM instructions, Lopez suggested. He said the language regarding “nationally distributed and periodically updated service specifications that are generally accepted by the autobody repair industry” referred to I-CAR’s directions — which just said to follow OEM repair procedures anyway. 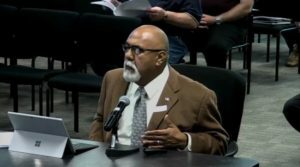 Lopez implied that leaving regulatory wiggle room for what was “generally accepted by the autobody repair industry” could lead to situations like John Eagle Collision using adhesive instead of Honda-demanded welds to glue a 2010 Honda Fit roof. The shop lost a $31.5 million verdict and later settled for an undisclosed amount. However, body shops should be permitted to deviate from OEM position statements and use recycled or aftermarket bolt-on parts, according to Lopez. Sometimes a shop needed to install such parts to avoid a vehicle totaling, Lopez said. Also, insurer business partners say in policies to install used or aftermarket components, even on late-model cars, he said. “We’re in a real pickle here,” he said. Unless the automaker outright uses words like “prohibited” or “not authorized,” it looks like the manufacturer is just “expressing their preference. And we know that it is,” Lopez said. It might be risky to assume a particular OEM turn of phrase means a position statement can be ignored as an suggestion rather than a requirement. However, position statements calling for a certain procedure should always be followed, he said. “There’s a very definite line there,” he said. Lopez also said all structural or suspension parts should be new OEM, just as the automakers demand. “Let’s make that certainly clear,” he said regarding those parts. He also gave the example of a 2018 model with 1,000 miles as a vehicle deserving of all new OEM parts.